I’ve been rekindling my relationship with outboard sound devices…the tactility, oddness, instability, and organic nature sometimes either can’t be reproduced by a plugin, or no self-respecting coder would choose to emulate such strange circuits, so virtual equivalents don’t exist. When buying such devices, sure, we all check online for demo videos and the like…but many of these devices are deep. Even testing one for an hour in a shop won’t really unveil its true potential…if the shop even has it in stock, given how the best sonic manglers are made by fiercely independent makers. And then what? You’re really going to bring a laptop to a guitar shop to test a Kontakt patch through a fuzzbox? Or your field recording of a dawn chorus through a delay pedal? Remember, too, that some film sound design has been done using effect pedals, like (the great-sounding but otherwise forgettable) Terminator: Salvation. This is where rentals come in handy. My recent searches for strange effect pedals led me to discover Mike Galen’s company, Effect or Die. After having purchased a couple of pedals, he pointed out that they have an effects rental program, and invited me to give it a try. I took him up on his offer, and took the opportunity to do some research into effect pedal rentals.What follows is a result of my trial, and my research into renting such equipment. To be clear and transparent: Effect or Die provided me with a free rental period in order to test the service. Renting effect pedals online is relatively new, with some of the bigger players only starting as recently as 2012. It’s a pretty self-evident concept: You pay a fee to keep a pedal for a short amount of time. It’s shipped to you, you use it, you send it back (usually prepaid, just drop it in the box of the appropriate shipping company). Simple. Rocknrollrentals, Carroll, and many others rent pedals, often inexpensively. But which pedals? If you want the run of the mill MXRs, Bosses, and Dunlops, go for it. But (pursuant to this blog’s focus) for sound design, sonic mangling, and more artful or destructive purposes, you need to go with more exotic options. Then you’re looking at services like TryAPedal.net, which does carry a lot of true boutique pedals. There aren’t many other players in that space. Maybe this is why some people abuse 30-day return warranties as an eternal rental service, which I think is a pretty unfair and deceptive practice. If you rent a pedal and fall in love with it, then you might want to just buy the pedal you rented. TryAPedal only has a rent-to-own program for some of its pedals. Many rental shops don’t provide this option at all. Mike started Effect or Die to support independent boutique pedal makers, which I not only respect, but is definitely where much of the innovation in this field is coming from. He’s got an edgy aesthetic and I admire his indie spirit. Most of his clients are guitarists, as you’d imagine, but some are noisemakers, drummers, synth players…and he loves to hear back what people are doing with the pedals he sells and rents. You can keep any pedal you want, and your rental fee will be deducted from the purchase cost. Simple terms. TryAPedal’s terms are built for scale and are quite complex. Effect or Die’s terms are simple, straightforward, and puts a lot of trust in the renter…where I think it should be placed. Plus, the rental period of 7 or 14 days is inclusive: You send it back AFTER the last day of rental, which starts on the day you receive the pedals. Effect or Die has some amount of inventory overlap with its competitors (Earthquaker, Walrus, Caroline, etc. ), but Effect or Die carries some rarely-rentable units from makers like Dwarfcraft, Infanem, Red Panda. The checkout process on Effect or Die’s website is like buying anything else online. My rental package of two pedals arrived in three days. Effect or Die’s pricing isn’t the lowest, but you’re getting access to pretty unusual stuff, and there are no hidden fees or strange insurance add-ons. The box included some stickers, a rental summary…and a single US penny. (Why? That’s for the recipient to figure out.) The pedals arrive without documentation or power supplies, which I don’t take issue with. Documentation is easy to find online, and everyone wants to power pedals differently (I use a Voodoo Labs Pedal Power 2 Plus). Perhaps a power supply option for rentals might be a nice addition for non-guitarists who want to experiment using effect pedals for sound design, who might not have such power solutions dialed in. I rented an Infanem Second Voice octave/fuzz pedal and a Red Panda Particle granular delay pedal. Some of my other choices were not in stock, one of the possible downsides of looking for niche effects from a niche rental service (which I’d expect would improve as his business matures). The pedals were new stock, though, and I suspect that I was their first user. 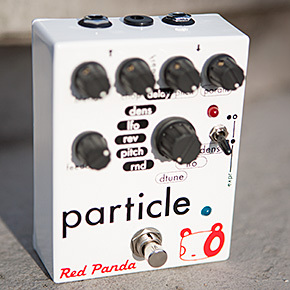 While this is a review of the rental service and not the pedals, the Red Panda Particle was destined to never leave my studio: It’s weird, glitchy, trippy, textural, and wasn’t easily reproducible with plug-ins…exactly what I love in a piece of outboard gear. All it took was an email to Effect Or Die, a new order was created online (again, minus the money you’ve already paid for the rental), checkout, and boom: I owned the pedal. Effect or Die then will also send the original box and contents, if desired, in a separate shipment. Overall, Mike’s got a solid system and is great to work with. The ordering and purchase processes were simple and pretty effortless. The only caveats are that his inventory can be limited (part curation, part small business reality), and options for renting power solutions might be a good idea in the future. If you see something you want to try, it’s a great service and an opportunity to experiment without committing to a straight-up purchase. Best of all, it’s run by a guy who loves weird noises and cares what you think. And that’s worth a lot. But no Noise Jockey post is complete without a sound sample. Here’s an example of what the Red Panda Particle can do with a single C2 note from a subtractive virtual synth (not playing in this clip…this is just that single note frozen and repeating in the Particle’s buffer), just tweaking the Delay and Param knobs. It ain’t musical. But it sure is fun.